Tonight marks the season finale of The Exorcist TV show on FOX. How’s this horror TV series been performing in the ratings? Should the network renew this series for a second season or, should it be cancelled instead? Based on the 1973 feature film, The Exorcist TV show follows two very different priests. Father Tomas Ortega (Alfonso Herrera) is progressive, ambitious and compassionate. 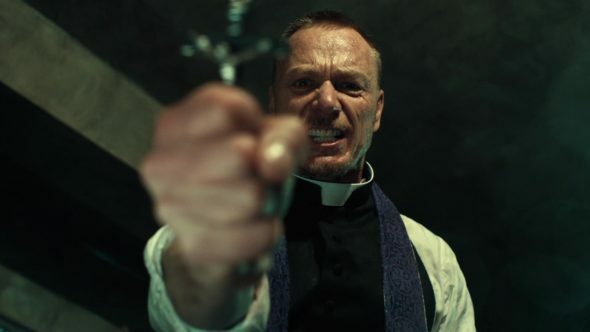 Meanwhile, Father Marcus Keane (Ben Daniels) is relentless, abrasive and utterly consumed by his mission. Together, they tackle a family’s case of a horrifying demonic possession. The series also stars Kurt Egyiawan, Geena Davis, Alan Ruck, Brianne Howey, and Hannah Kasulka. The Exorcist series launched on September 23rd and attracted a 0.97 rating in the 18-49 demographic with 2.85 million viewers. Even for a Friday night series, this was a disappointing start in the ratings. Unfortunately, the ratings have only gotten worse as the season’s progressed. In week two, the demo rating dropped nearly 40%, falling to a 0.6 rating with 1.976 million viewers. Some later episodes have risen to a 0.7 in the demo but total viewership has either remained about the same or dropped even lower. Episode seven hit a season low with a 0.6 in the demo and 1.61 million. Based on these ratings alone, The Exorcist will surely be cancelled. It seems that fans’ best hope for a second season renewal is if the studio and network have found alternate ways of making this series profitable for them. But, what do you think? Do you still like The Exorcist TV show? Do you think that it should be cancelled or renewed for a second season on FOX? More about: Quick Questions, The Exorcist, The Exorcist: canceled or renewed? I thought the acting was excellent, Geena Davis was at her finest! Both priests were great, too. I am disappointed. It would be nice to see a second season. The show has great actors and strong characters. Well Done.Great Show,the cast is excellent.